KASSIDY, Cheek Mountain Thief, The Staves, Olympic Swimmers, Beth Jeans Houghton & The Hooves of Destiny and more. Glasgow plays a big -part in tonight&apos;s show. Kassidy. Admiral Fallow and Olympic Swimmers all prove that fact. An Interview segment from Stealing Sheep about their music and their style, the a track by them which weaves and bobs. Nick Cave and The Bad Seeds showcase their new single. Morrissey come in at the end to show that he is still with us for no reason. 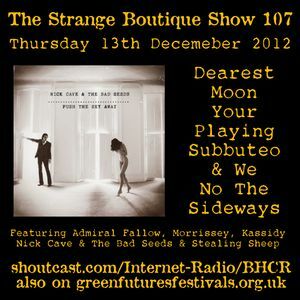 Other folkie types blow through with The Staves, Cheek Mountain Thief and Beth Jeans Houghton & The Hooves Of Destiny. All in all it&apos;s one pretty good show and the excitement builds from start to finish as Admiral Fallow and Olympic Swimmers play the Green Door Store in Brighton that night. Presented by David A. Sharman who is on form. First broadcast on Brighton and Hove Community Radio and Green Futures Festival Radio on Thursday 13th December 2012 at 7pm. Come and be friends at facebook.com/thestrangeboutique.